So it all comes down to this; one final review that literally brings us to the moment people have been clamoring for probably since 1983. Granted, I still love "Revenge of the Sith" despite the reservations of my cohorts at Simplistic Reviews, so I've only been waiting for another "Star Wars" movie for ten years. Without further adieu, let's slide right into "Return of the Jedi" from 1983. "Jedi" picks up soon after the events of "The Empire Strikes Back." A rescue mission has brought our cast of characters to the lair of the vile criminal gangster, Jabba the Hutt on Tattoine to free Han Solo, still frozen in carbonite. All goes well until Leia, disguised as the bounty hunter Boushh, is found freeing Han from his carbonite prison and becomes Jabba's personal cuddle buddy. However, when all seems lost, enter Luke Skywalker, now a full-blown Jedi Knight to the rescue. But of course, he is captured as well after nearly meeting his demise at the hands of a Rancor. But like all good plans, there is a third man on the inside; that man is Lando Calrissian, the administrator of this rescue. After traveling out to the Dune Sea of Tattoine; Luke, Han, and Chewbacca all learn their fates that they will be fed to the Sarlacc. Springing into action, Luke is able to free his friends, avoid being eaten, and destroys Jabba's Sail Barge, but only after Leia offs him herself. While on Endor, the group encounter Stormtroopers on Speeder bikes, but more importantly, they encounter the fuzzy inhabitants of Endor, the Ewoks. 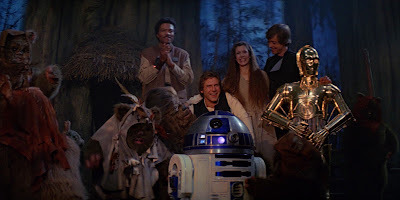 Luckily before Han, Luke, and the rest of the team become dinner, Luke makes them see the error of their ways and makes the ever-worried, C-3PO as a golden god which the Ewoks worship. After being freed, Luke decides it's time to face his father, Darth Vader, again, while Han, Leia, Chewbacca and the Ewoks assault the shield generator with the rest of the Rebel fleet ready to attack the Death Star. Captured by Vader, Luke is taken to the Death Star to meet with Emperor Palpatine who tries to tempt him to follow his father's path to the Dark Side. Luke fights his father in an epic lightsaber duel, but rebuffs The Emperor who tells him to strike Vader down. Finally seeing the error of his says, Vader dispatches Palpatine while saving Luke and redeeming himself in the process. Meanwhile, on Endor, the shield generator is shutdown and the assault on the Death Star begins as Lando leads the charge in the Millennium Falcon. Needless to say, good prevails and evil is defeated, while Anakin and Luke reconcile in his dying breathe. It all ends with a grand Ewok celebration and Lando clapping his hands. That's the film in a nutshell, and if you got through my plot ramblings, I'll make my thoughts on this film quick. .......Ewoks. Yes, Ewoks. You can certainly tell this was a George Lucas decision to include more bankable and economic-generating creatures in a galaxy far, far away, but of course close enough to a Toys R' Us. Maybe if I was of an age when this film came out, I'm sure I would have been begging my parents for a stuffed Ewok, but looking at it now from an objective film-goer, the Ewoks rank up there with the Gungans on useless and annoying "Star Wars" creatures. Sure, stone me for comparing Ewoks with Gungans, but in reality it was Chewbacca that got on that AT-ST and helped defeat the Stormtroopers, not the Ewoks. 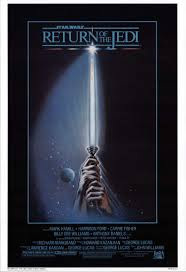 Ranking as my #3 (current) film in the "Star Wars" film franchise, "Jedi" has it's share of great scenes and high adventure, but there are just enough quirks and overall annoying creatures that keep this from being #2 on the list. With that being said, we are here....the moment many have been waiting for for ten long years....The Force has awaken....catch all of you soon.